Chef Frédéric Lange is the Chef/Owner of Lavender Restaurant with his wife/partner Graciela Lewis Lange, located in Southern Arizona. A native of Champagne, France, Lange began his culinary education at an early age, then perfected his classic training in Paris, moving to Provence to begin his career as a chef. The Provençal region of Southern France is known for it's climate, wonderful cuisine, and lavender. 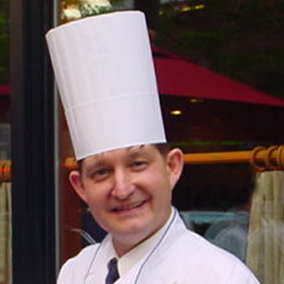 Chef Lange was inducted as a Maître Cuisinier (French Master Chef) June 18, 2005, in Portland, Oregon. He was awarded the title by the Maîtres Cuisiniers Des France, the Paris-based association of international French Chefs. Chef Lange is the only French Master Chef in Arizona; one of 47 in the United States, and 400 world-wide. The Maîtres Cuisiniers des France was chartered in 1951, and holds their member chefs to 12 tenets of performance. Briefly, Maîtres Cuisiniers are held to the highest standards of both personal and professional conduct and performance. They must consistently demonstrate the highest level of culinary art, and be leaders in their field as well as outstanding restauranteurs. First and foremost, they must perpetually be aware that they "belong to the renowned cultural tradition" and pass the classic techniques and recipes to the next generation. Prior to starting the Lavender Restaurant in Green Valley, Arizona, Frederic Lange has been the Executive Chef at several fine-dining establishments in France, and Washington, DC area. Chef Lange worked most recently as the Executive Chef of The Lafayette Restaurant at the world class Hay Adams Hotel, located across the street from The White House. Prior positions in the US include Executive Chef at La Colline on Capitol Hill and Executive Chef at Sea Catch Restaurant on the Canal in Georgetown. Chef Lange proudly became an American citizen in 1999.